The fourth quarter US GDP revision came in this morning with headlines blaring that the quarter-over-quarter annualized growth of 1% “exceeded expectations” because the number was revised upward from the prior level of 0.7% and beat economist expectations for 0.4%. Not talked about, however, was the final year-over-year real GDP number for 2015: 1.9%. Today’s data continues a long string of anemic year-over-year real GDP prints going back to the financial crisis. Since the end of the financial crisis, quarterly year-over-year real GDP has averaged a paltry 2.11%, without a print above 3% at any point. While there are certainly many different factors that have contributed to the anemic growth, we’ve several times in the past pointed out the underappreciated but highly influential impact of national deleveraging since the financial crisis. There are certainly practitioners out there—Ray Dalio comes to mind on the investment side and, of course, Reinhart and Rogoff in academia—that have written extensively about the relationship between the path of the debt supercycle and the growth trajectory. More often than not, though, the headwinds due to debt deleveraging get ignored in favor of other explanations. 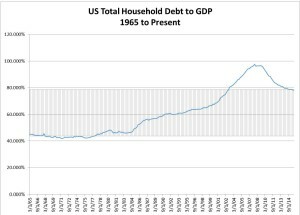 So, as we’ve done before in the distant past, let’s look at a few charts that provide a nice visual representation of debt dynamics over the past 50 years or so in the US. 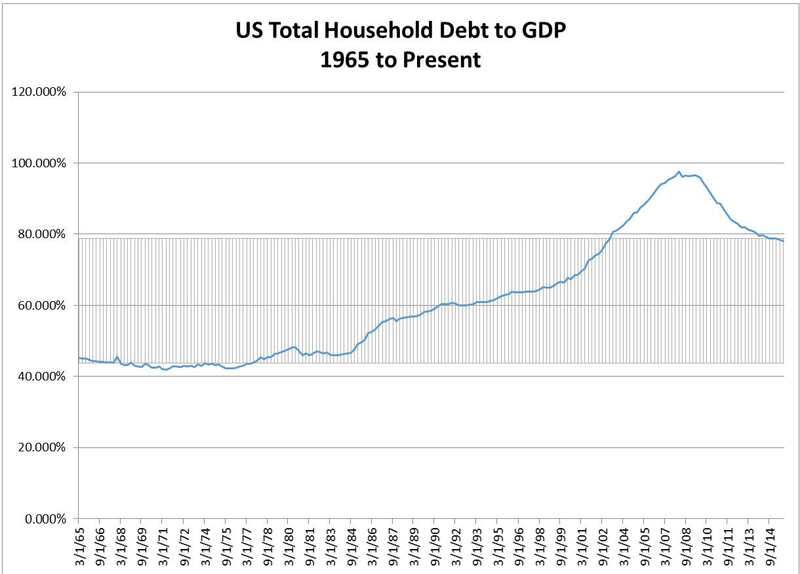 Source: Federal Reserve As you can see above, the US economy had a massive gust of wind at its back from the early 1980s until the Great Recession as household debt to GDP doubled. This was true pixie-stick, sugar-high economic growth. Since early 2008, the beginning days of the financial crisis, this data series has been thrown in reverse. 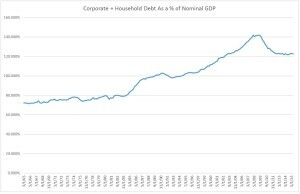 Debt has been reduced to the tune of 20% of GDP since that time. It hasn’t stopped declining. 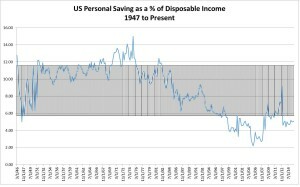 2% of that 20% decline has occurred in the past two years, even with some of the lowest interest rates ever observed. 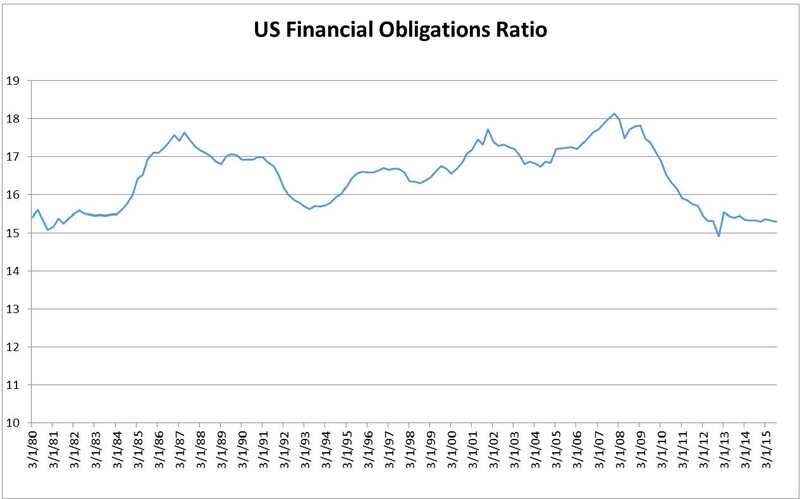 Look at the Financial Obligations ratio below, for instance. This takes standard household debt service as a percentage of disposable income, then throws in other household fixed costs such as insurance, property tax, rent, etc. 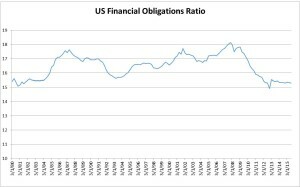 As you can see, the financial obligations ratio is basically at the lowest levels observed over the past 35+ years. Ultimately, the Fed can work to cut interest rates/debt service costs to the bone, but people still want to conservatively manage debt burdens. In essence, the US economy is now tacking into the wind, whereas for two to three decades before, the US and global economies had wind in the sails. 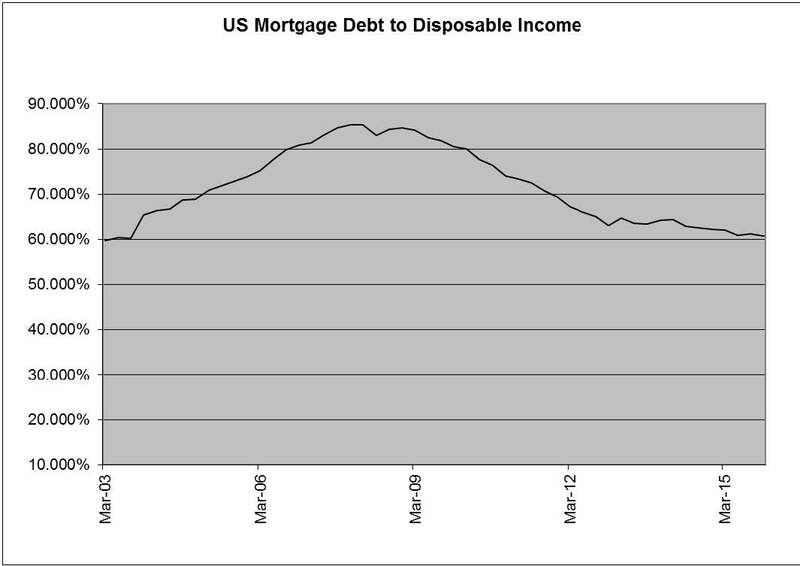 Where/when does deleveraging stop? Nobody knows. Auto loans as a percentage of income have actually ticked up nicely, which makes sense considering the strong US auto sales numbers in recent years. 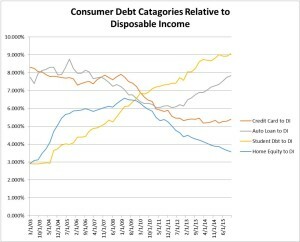 Student loans continue to rise a percentage of disposable income, even after the data series has tripled over the past decade. 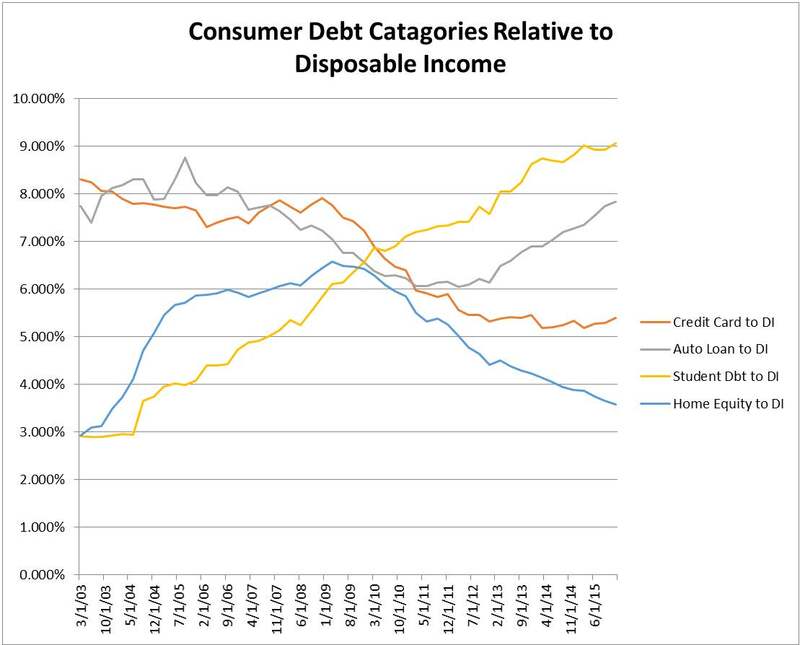 Credit card debt has declined meaningfully, though, as a percentage of income. And home equity loan activity has completely round-tripped back to the levels observed way before the final days craziness of the housing boom. 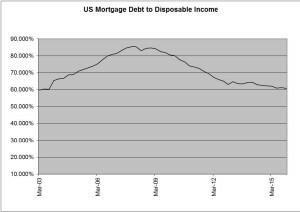 Overall mortgage debt? Well that’s completely roundtripped too. 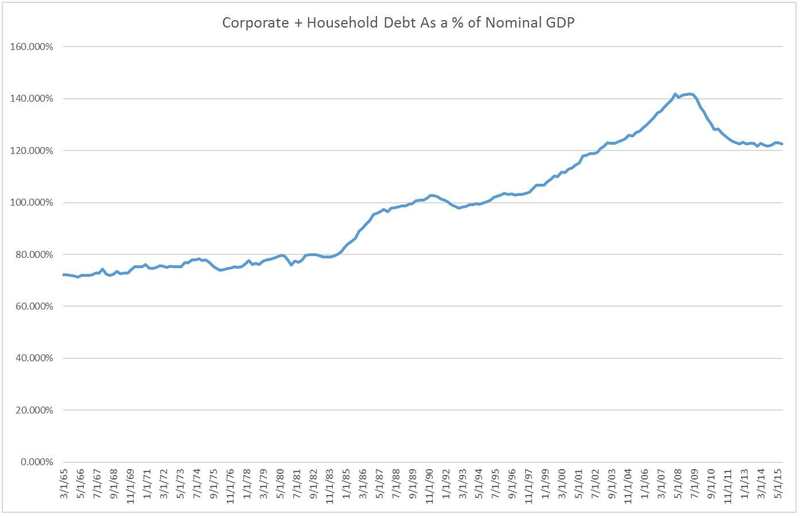 The last few times corporate debt reached these levels as a percentage of GDP, the up move was thrown into reverse. Should we be concerned about this going into reverse? 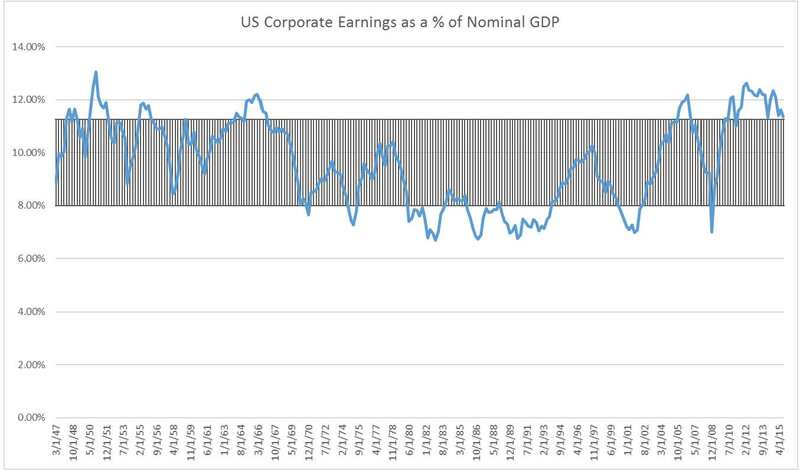 US corporate earnings are stalling for the first time since the crisis, which might influence a move towards corporate deleveraging. 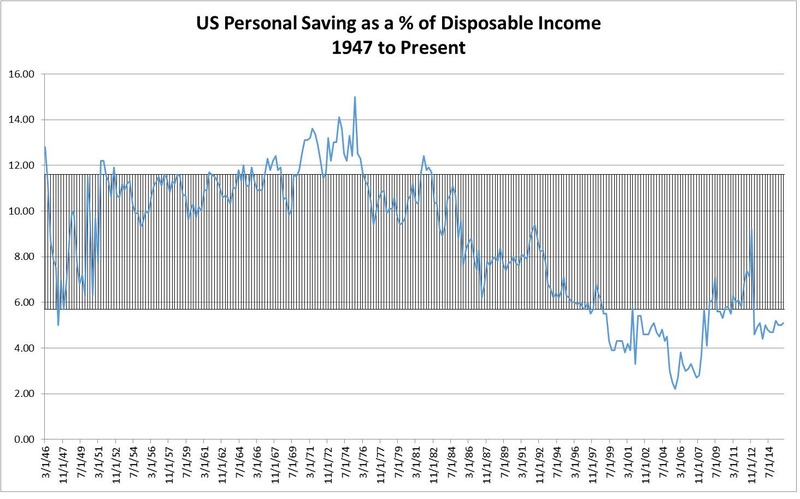 Last but not least, US savings rate as a percentage of disposable income, a number that comes out with the personal spending and income numbers each month, provides another nice visual of how Americans threw caution to the wind for many years leading up to the financial crisis. They’re now, slowly but surely, working to claw back. In the US at least, until the debt deleveraging headwinds subside meaningfully, we think it’s going to continue to be very difficult for the US to achieve economic GDP growth levels we became accustomed to for the ‘80s, 90s, and 2000s. It took three decades for the indebtedness bubble to blow up. As Reinhart and Rogoff have pointed out, it usually takes a good while for the post-crisis deleveraging to run its course.